After a very nice day off work, we stopped for lunch at Frankie and Benny’s. The place was quite quiet on lunch time a weekday lunch time. As there isn't a branch of Frankie and Benny's near where we live, I'm not that familiar with their lunch menu. 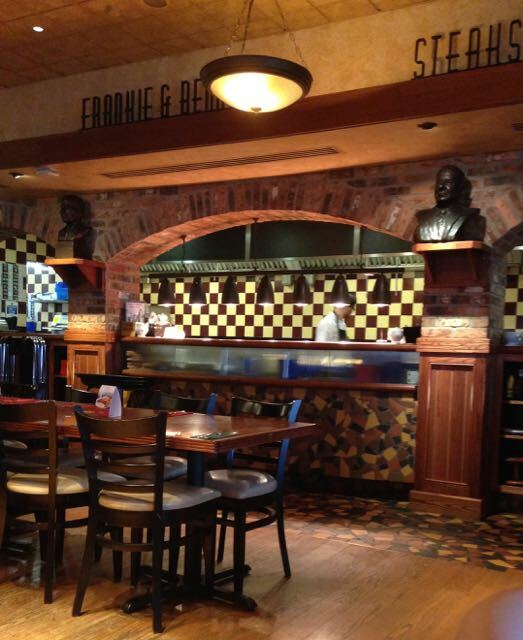 Trips to Frankie and Benny's are a bit of a treat, although I do keep hoping they will open one closer to home. Anyway one quick browse of the lunch menu and I spotted the option of "Pizza Dog". I had sort of been planning to have a pizza when I went in, but suddenly this sounded too intriguing to miss, I am a food blogger after all. To be honest we hadn't gone in with the intention of blogging about the place, we had gone in just for lunch, but when the friendly waitress came over and said it was a new item on the menu, the camera came out. Spectre had fancied a burger and fries, and couldn't be shifted on this! My Pizza Dog arrived, complete with coleslaw and fries (salad was an option, but it wasn't really if you see what I mean). 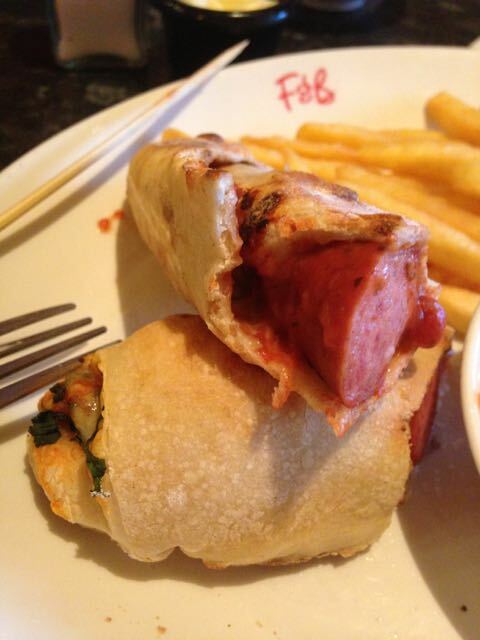 The hot dog looked quite chunky and was wrapped in pizza dough and tomato sauce. I did attempt to pick it up but it was a little hot on the fingers, so I decided to munch some fries while they were hot too instead. I went back to the Pizza Dog and gave it a try after it cooled a little, wow it worked. Now it seems obvious that a hot dog sausage would go really well with tomato ketchup, but if you up that to a proper rich Italian tomato sauce, mozzarella, and lashings of basil you are still onto a winner. The Italian / American combination was spot on. I loved the herby flavour and stronger tomato. The pizza dough base was like a doughy wrap which worked well, and had a good flavour. It added to the satisfying feeling as it made the hot dog quite substantial especially for a lunch time. 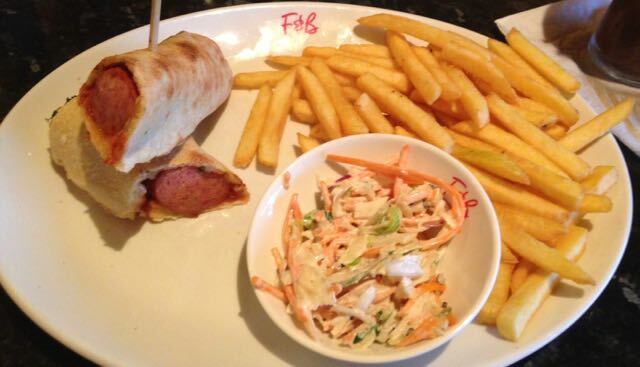 So in conclusion the fusion food that is the Pizza Dog, as done by Frankie and Benny's, is a complete success. Perfect for those that can't decide between hot dogs and pizza, and for those that like to try something a little different. I always think that is the point of going out, but Spectre pointed out that his burger was fantastic and felt like it had been “made with love”, so I guess they've got their bases covered too.